Cherry Pie and Thanksgiving – Voila! 2. Roll out smaller piece of dough on lightly floured surface. Transfer dough to pie plate. Leave dough that overhangs the side of the plate. Refrigerate dough-lined plate until ready with the cherry filling. 3. Remove dough strips from freezer, let stand at room temperature until malleable. Form lattice top by weaving the strips together. Once formed, return lattice top to freezer for another 5-10 minutes. 1. Mix together cornstarch, 1 cup sugar, cinnamon and salt in medium bowl. 2. Stir in cherries and almond extract. Toss until cherries are evenly covered. 3. Pour cherry mixture into refrigerated pie plate. Lay lattice top over filling and crimp the lattice top into the dough overhang. 4. Lightly brush lattice with 1 T. water and sprinkle with sugar. Place pie on baking sheet. 5. Lower oven temperature to 425. Bake until crust is set and begins to set, 25-30 minutes. Rotate pie and reduce oven to 375; continue baking until crust is deep golden brown and juices bubble, another 25-30 minutes. Cool on wire rack before serving. Voila! And have a happy, happy, happy Thanksgiving! I love a good cherry pie. I think I might be going with a vanilla pear pie that’s floating around one of the many Thanksgiving-themed magazines that are kicking around the house this year. It’s in the Thanksgiving issue of Bon Appetit! What a great recipe! I love pie and cupcakes. Do you have a recipe for pecan pie. What about boysenberry? What a delicious blog you have. Keep up the good work! I love pies so much. Our Thanksgiving tradition is to make an apple pie. 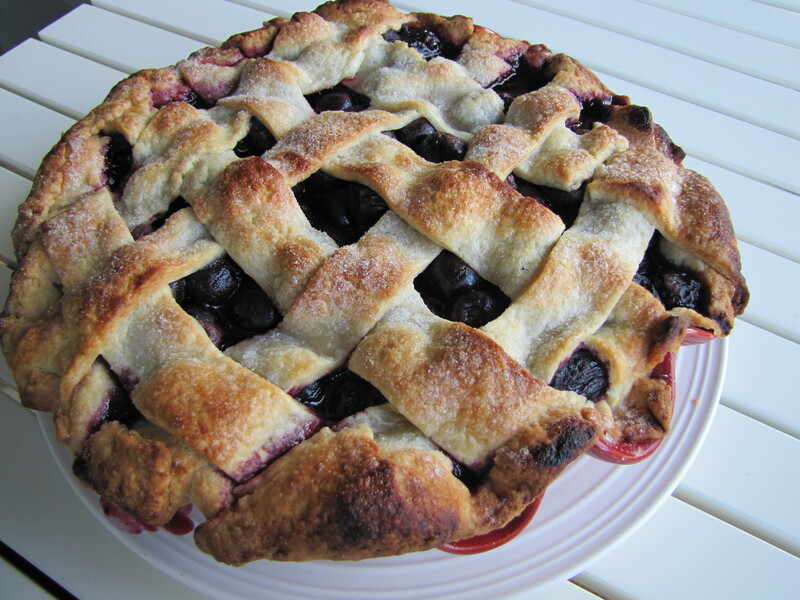 But maybe next year I’ll feel adventurous and try out this cherry pie!